Salicylic acid is a beta hydroxy acid commonly used to treat comedonal or non-inflamed acne. It is a popular ingredient in many over-the-counter products. Salicylic acid is found in lotions and creams, cleansers, medicated treatment pads, solutions or "toners." Salicylic acid helps correct the abnormal desquamation process that occurs in acne-prone skin. It works as an exfoliant, promoting the sloughing away of dead skin cells. Salicylic acid is especially helpful in treating acne because of its ability to penetrate the follicle. It encourages the shedding of dead skin cells from within the follicle, helping keep the pores clear of cellular debris. In this way, it reduces the number of pore blockages and breakouts on the skin. Topically, as a beta-hydroxy acid (and unlike alpha-hydroxy acids) salicylic acid is capable of penetrating and breaking-down fats and lipids, making it capable of causing moderate chemical burns of the skin if at very high concentrations (such as near or actually the majority ingredient) within a solvent. It is capable of damaging the lining of pores in such cases if the solvent is alcohol, acetone, or an oil. Over-the-counter limits are set at 2% for topical left on the face and 3% for those expected to be washed off, such as acne cleansers or shampoo. Over-the-counter salicylic acid products are found in strengths ranging from .5% to 2%. Typical use consists of a once-daily application. Of course, follow all directions printed on the package. Depending on your preference, begin by using either salicylic acid pads or a salicylic acid lotion, cream, or gel. Do not use both. Using several salicylic acid products will excessively dry the skin, and will not clear acne any faster. After the skin is sufficiently clear, a salicylic acid wash or scrub can often be used in place of gels or pads to maintain clear skin. Continuous use of a salicylic acid product is necessary to obtain and maintain positive results. 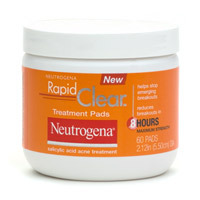 If you stop using your treatment product, the pores will again clog with excess oil and dead cells, and acne can return. Salicylic acid can cause stinging, burning, and skin irritation. You may also experience dryness, peeling, and flaking of the skin. These side effects can usually be effectively controlled with daily use of an oil-free moisturizer.